When I was confirmed, on Advent Sunday in 1987, I received this little book. Each of us who was confirmed that day received a different book; my friend was given The Great Divorce by C S Lewis. Our vicar was from East Anglia so that may be why he had chosen this as one of the books presented that day. Enfolded In Love was first published in 1980, and was the beginning of a series of the same name. There is another book of Julian readings, called In Love Enclosed, in addition to a number of others, including the Cloud of Unknowing, Thérèse of Lisieux and St. Teresa of Avila. So many things are referred to as ‘pocket-sized’ when in fact no one has pockets big enough for the items described so, but these books really are: 15cm x 10cm and less than 100 pages. The series was edited by Fr Robert Llewelyn, who more than anyone else has been responsible for introducing people to Julian and her writing. The royalties from Enfolded In Love and In Love Enclosed were donated to the Julian Centre. I had the honour of meeting him in 1998, but I will write more about him later. He deserves a post devoted solely to him. This little book is what drew my heart to Julian, and even now I still dip into it when I want to find a quote easily. The translation, credited only to ‘Members of The Julian Shrine’, is beautiful. It uses modern language, but keeps ‘All shall be well’ in its familiar form. The pronoun ‘he’ is not capitalised, as it is in some translations. It is the perfect introduction to Julian’s writing. Unfortunately it seems to be out of print now. Recently I have been trying out different translations of the Revelations. I’m hoping to find the one which connects me to Julian’s voice the most. There are two I’ve already read which I’ll blog about soon, and another I’ve just started. I’m surprised by how different each one is, how much I may like one or find another difficult. 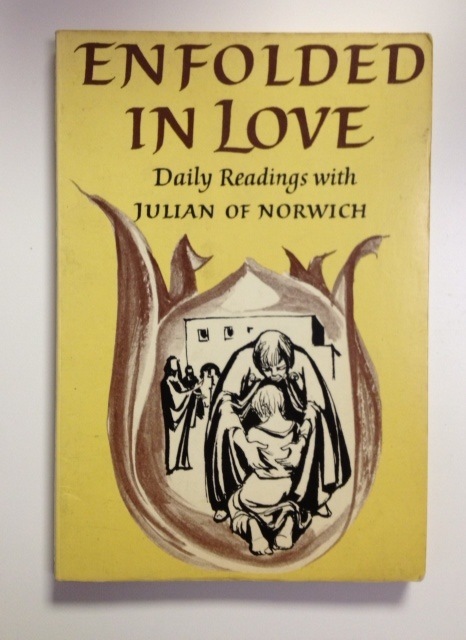 But for the Julian newbie, or for something truly pocket-sized, Enfolded In Love is a great start. This entry was posted in Editions of Julian's writing, Julian of Norwich and tagged Advent Sunday, east anglia, julian shrine, Robert Llewelyn by tokyopurplegirl. Bookmark the permalink. From another Lover of Julian . . . Thank you for reading! My personal favourite so far is Elizabeth Spearing’s Penguin Classic translation, but I am exploring others. At the moment I’m reading Fr John-Julian’s The Complete Julian of Norwich. I hope to read as many as possible and find the one that works best for me. I don’t have the Grace Warrack translation, I’ll have to try and find it.